tribute to Las Vegas' Superstars! 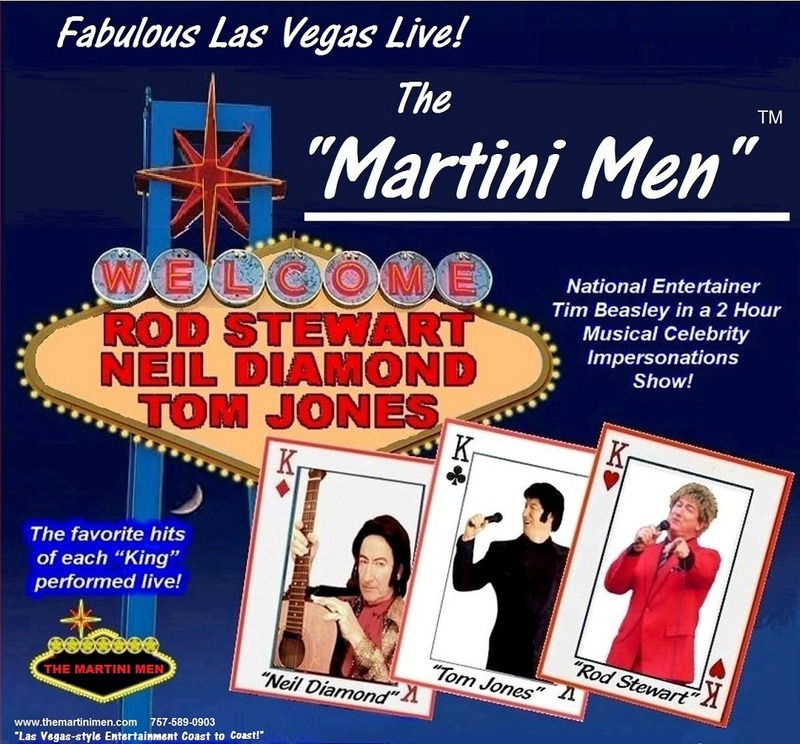 "The Martini Men” TM feature the full tribute-impersonations performances as "Frank Sinatra, Dean Martin, Bobby Darin, Tony Bennett, Andy Williams, Paul Anka," and the "younger guys" Rod Stewart, Neil Diamond, Billy Joel, Engelbert Humperdinck and Tom Jones" in a glamorous and high-energy exciting Las Vegas-style-show! Just a few updates over the recent years! 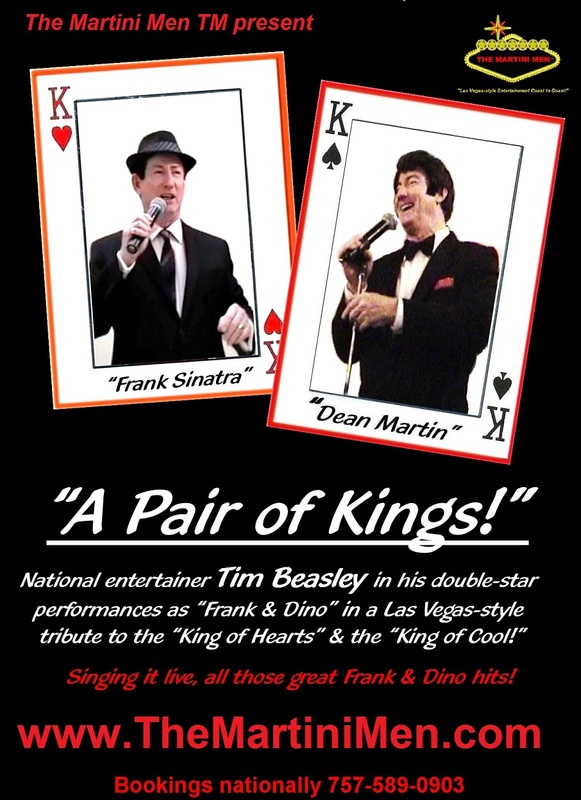 Update: Friday Jan 4, 2019 "Tony Bennett, Frank Sinatra, Billy Joel & Rod Stewart" rock the Ascension Hospital Group of Stevens Point, WI for their big "After Holidays Party!" Update: Wednesday 2/14/18 "Rod Stewart, Neil Diamond & Tom Jones" rock the exclusive Coronado Shores Beach Club, San Diego, CA for their big "Valentines Night Party!" 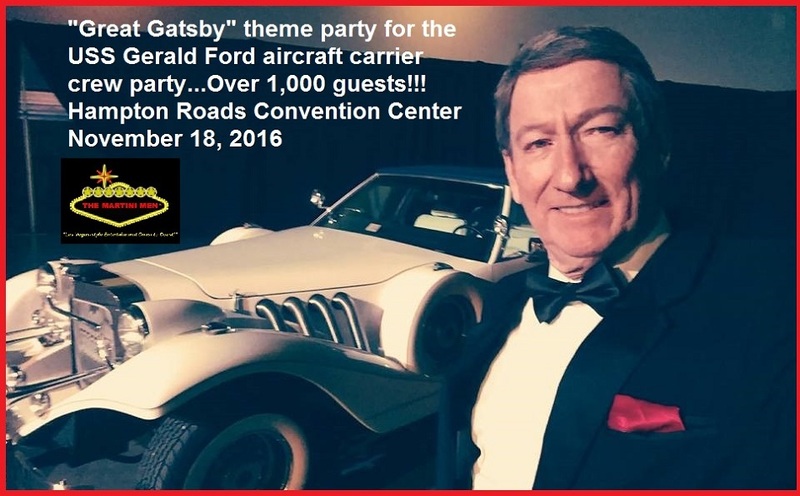 Update: Friday 11/18/16 "Frank Sinatra" entertains the US Navy USS Gerald Ford aircraft carrier. tradeshow at Las Vegas Convention Center. 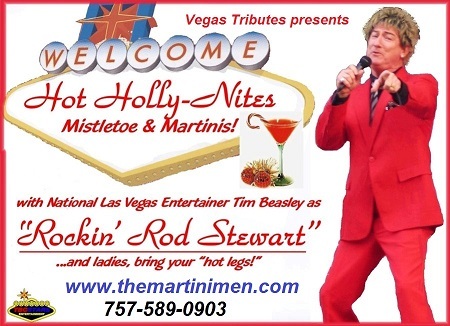 Update: Thursday 10/6/16,"The Martini Men's Rod Stewart, Neil Diamond and Frank Sinatra" had a great time entertaining for the "Gelita Late Show" at the huge Supply Side West trade show in the Mandalay Bay Convention Center, Las Vegas, NV. 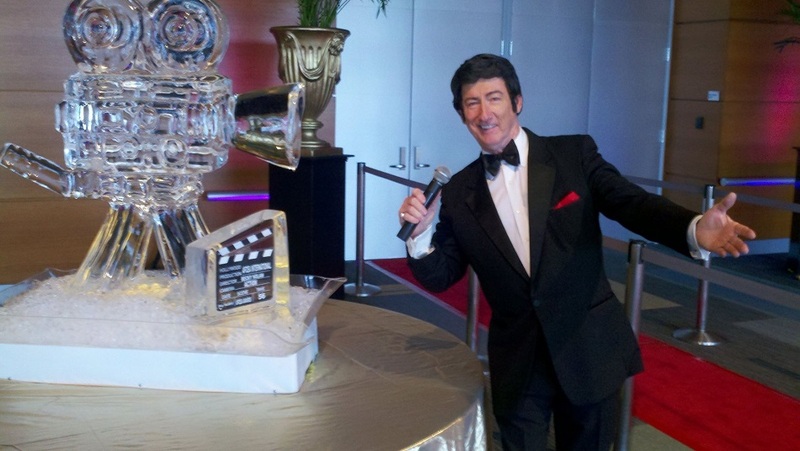 Ready to add some Las Vegas-style glamour to your event, nationally! 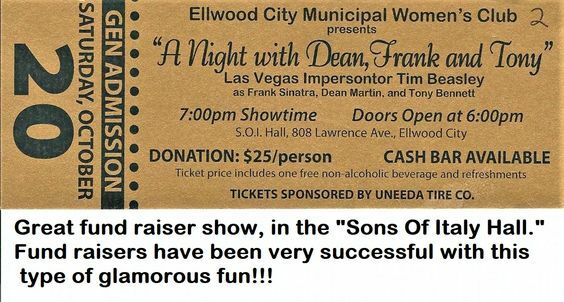 Nothing beats the great sounds of classic and cool Las Vegas, and "The Martini Men” TM feature the full tribute-impersonations performances as "Frank Sinatra, Dean Martin, Bobby Darin, Tony Bennett, Andy Williams, Paul Anka," and the "younger guys" Rod Stewart, Neil Diamond, Billy Joel, Engelbert Humperdinck and Tom Jones" in a glamorous and high-energy exciting Las Vegas-style-show! Be sure to see each of the "Martin Men's" individual web pages by simply "clicking" on their name at the top header of this homepage! They’re looking for a great party to sing, laugh and entertain with a great audience…and all 11 travel nationally for "martini madness” coast to coast, on only one ticket because all 11 are actually a one-man show spectacular!…”The Martini Men” are a swizzle -stick in the drink for a lot of grand openings, special marketing events, black-tie galas, fund raisers, awards banquets, all manner of celebrations and sophisticated soiree’s!!! 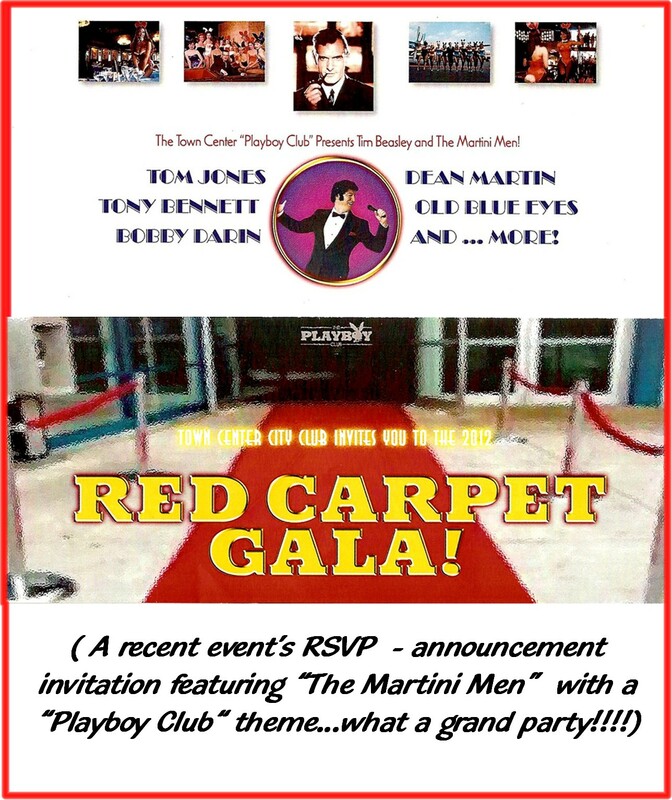 Perfect for any fun and glamorous occasion or special event, "The Martini Men” are superb "traffic builders” for attracting the crowds and also very interactive with audiences, and even during "breaks” can include Las Vegas lounge swing dance sets to great favorites for a complete themed evening…Plus everyone loves getting "paparazzi photos” with their favorite ”Martini Man!" 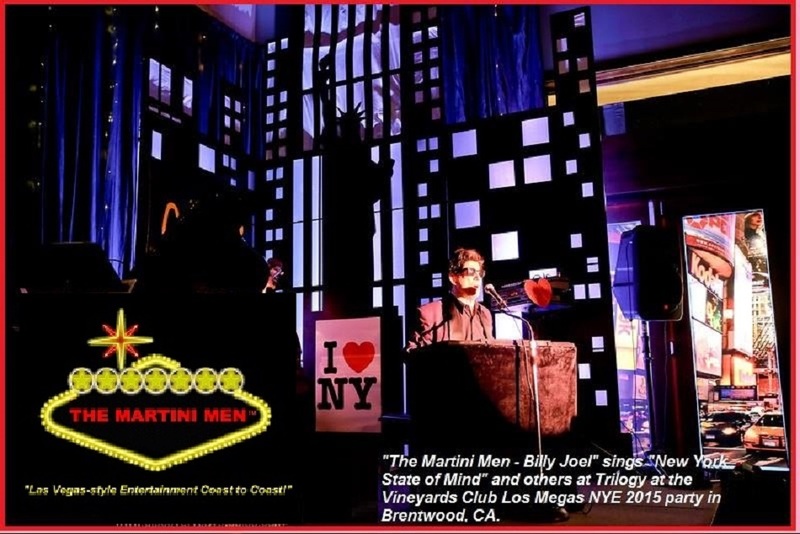 "The Martini Men” TM " stir up lots of fun, toasts, roasts and the coolest of tunes for your "mixer,” be it social, biz or just a good ole "martini madness” party. 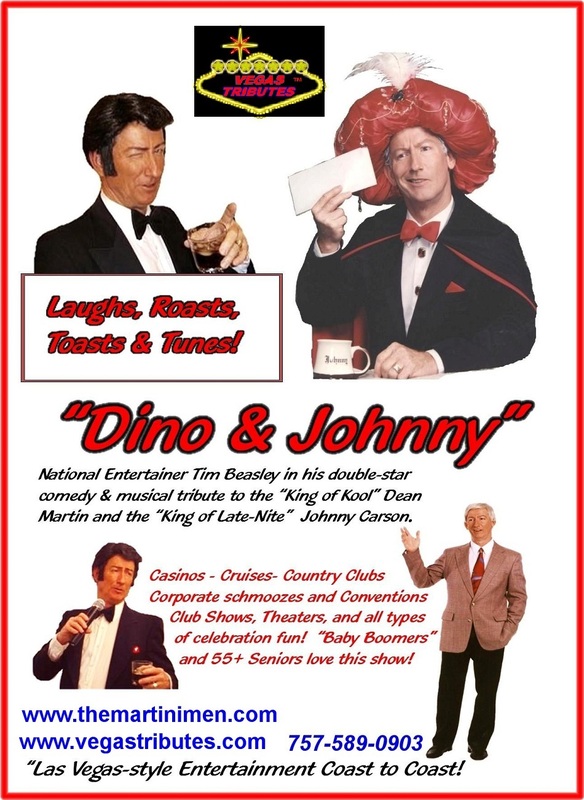 Vegas Tributes Entertainment has proudly produced these exciting classic Las Vegas-style shows nationally - internationally for over 25 years. Booking now for the 2019 -2020 Holidays seasons. Bring a real touch of class and high-fashion fun to your holiday parties!....and, it's never too early, or late, to book Christmas and NYE!!! 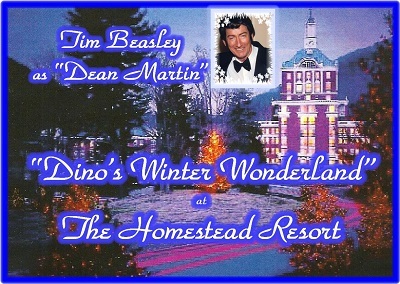 Previous engagements for the holidays have included "Dino's Winter Wonderland" at the world famous "Resort of the Presidents," the Homestead 1766 Resort...This show is booking in advance, so make your dates! 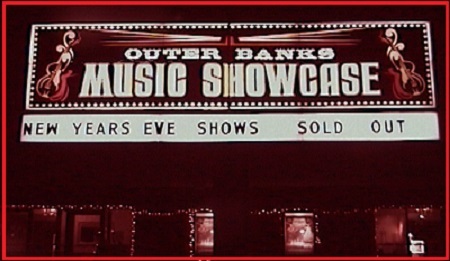 NYE 12/31/09 booked at the Outer Banks Music Showcase, Kitty Hawk, NC...2 Sold out shows!!! 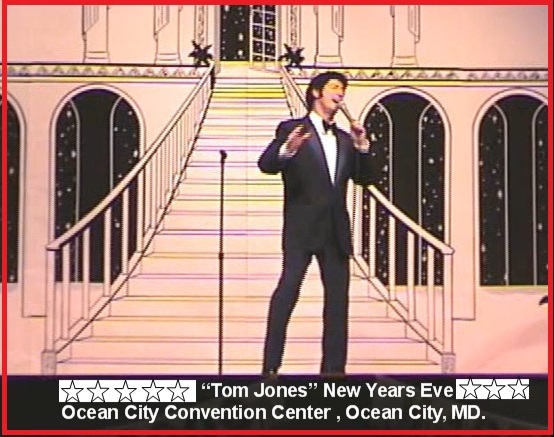 NYE 12/31/13 booked at the exclusive Four Seasons just south of Washington DC...great crowd!!! 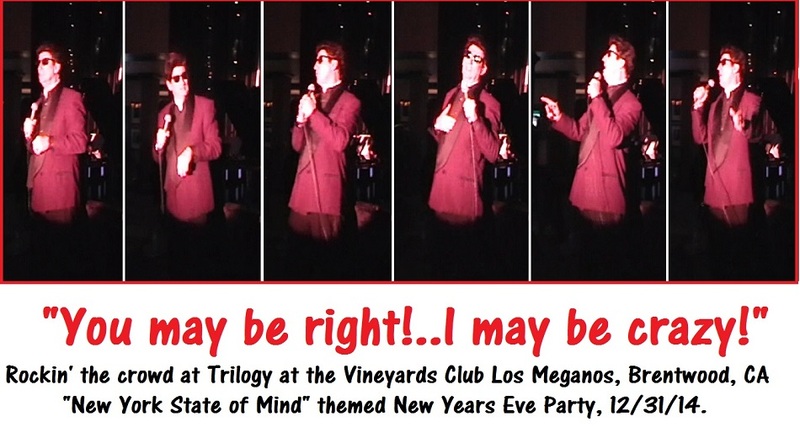 NYE 12/31/14 booked in Brentwood, California at the exclusive Triology at the Vineyards' Club Los Meganos! Make it a glamorous holiday celebration with a real, live Las Vegas-style "Martinis & Mistletoe" mixer of a crowd pleaser show. 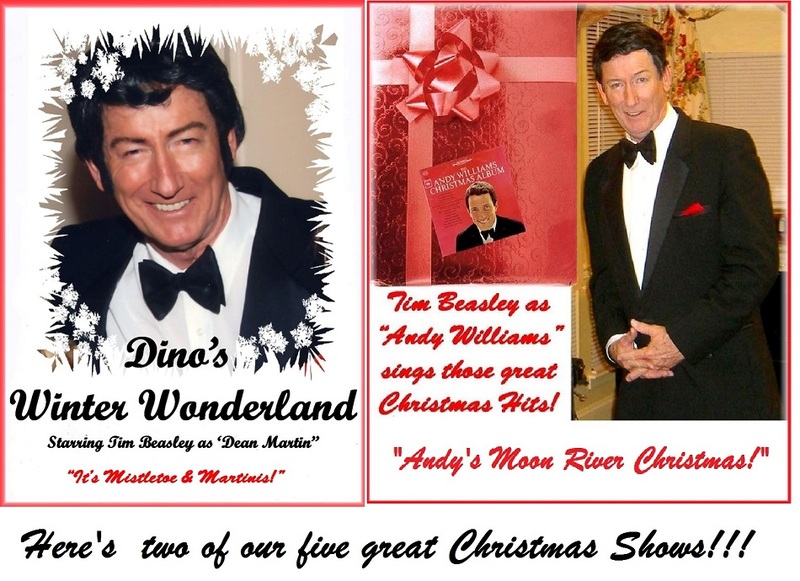 We have several grand offerings, "Dean Martin's Winter Wonderland," "Andy Williams' Moon River Christmas" tribute to his classic TV Christmas shows, "Frank Sinatra's Fireside Christmas" and of course as any of the "Martini Men" they sing the Christmas & Holidays hits! 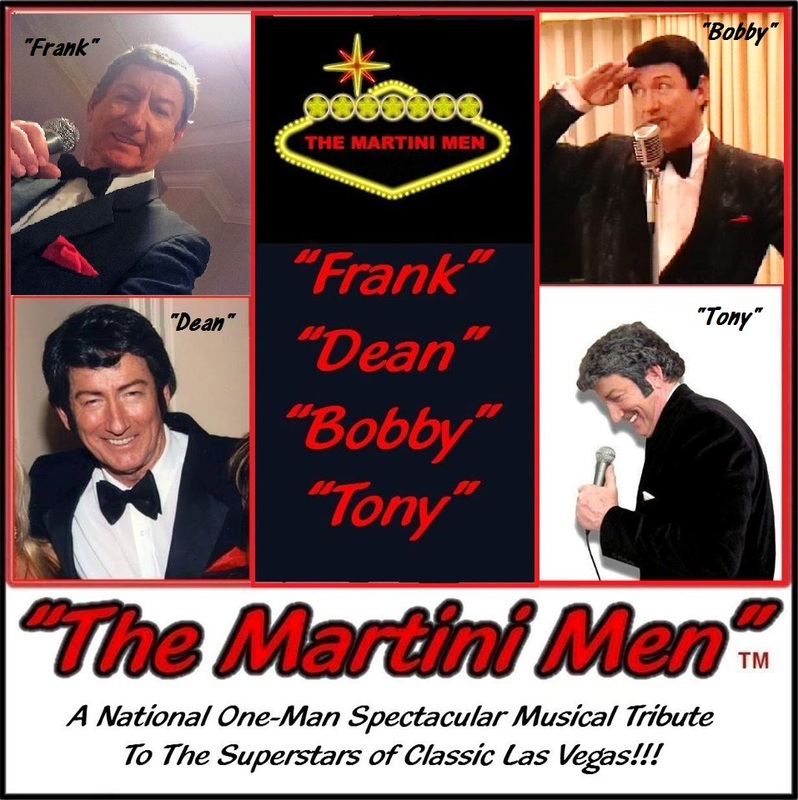 See more on the Dean Martin, Andy Williams and Rod Stewart pages. .
....and now, back to our "Martini & Las Vegas-style" shows for your "Parties Anytime, Anywhere!" 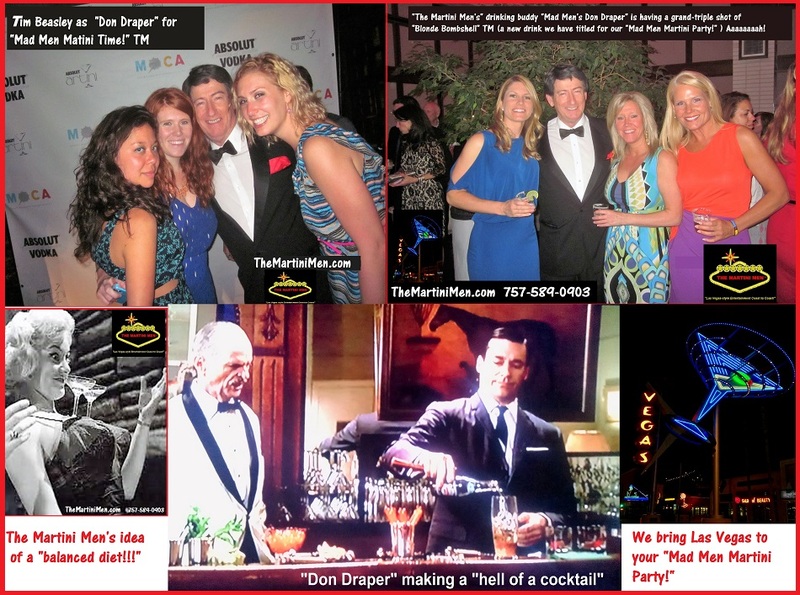 We even have specific OPTIONAL themes, like our 1960's flavored "Mad Men Martini Shows" illustrated in these montage photos featuring our very own "Dean Martin" doubles as "Mad Man Don Draper" as the MC for your glamour bash, Hi-Fi fashion social mixers!!! These exciting shows are easily tailored to your event time needs, from 30 minutes to 3+ hours. As a professional musical tribute star act, it's all live singing vocals, complete in true impression, mixed with superb "backing track instrumentals" of a big band to give the sound and feel of an actual Las Vegas concert, or, with your good band that knows the tunes ...It's very high in visiblity, too, with the great looks, the moves, the sound and the feel of each star in a powerful yet compact and intimately staged setting...in other words, The Martini Men virtually bring Las Vegas to you and your guests! Here's a few optional "winning hands"
There's a lot to see, with photos, client lists and endorsements, song lists, videos of actual performances, even ideas for your events. 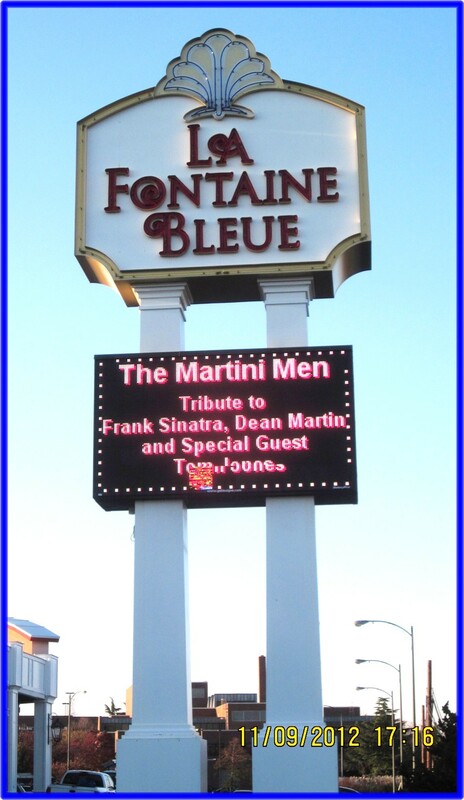 Please take the web site tour using the convenient navigation tabs at the top of the page for highlighting every "Martini Man" and we'll be very happy to speak with you by phone or e-mail on having "The Martini Men" entertain for your special event!